Russia has a strong stake in Asia. The U.S. should recognize this. The Sochi Olympics should help counter the view that Russia is not an influential player in Asia. Whereas major European and U.S. political leaders have boycotted the event, the leaders of China and Japan could not. Indeed, Sochi witnessed vigorous trilateral diplomacy as Japanese Prime Minister Shinzo Abe and Chinese President Xi Jinping lobbied for Russian President Vladimir Putin’s favors. Russia has critical national interests in Asia and employs diverse tactics to pursue them. Moscow’s main problem is that, while it has major stakes in Asia, its means to pursue them are weak. In some cases of overlapping Russian-U.S. national interests, it would prove mutually beneficial for Washington to help Moscow to achieve its goals. Russia’s overarching goals in Asia generally include promoting multipolarity (limiting U.S. influence but also managing China’s rise), developing beneficial economic relations, having a visible presence in all major Asian events and institutions (to accord with the vision of Russia as a great power), and minimizing the adverse impact of regional disputes while seeking to exploit some of them to enhance Russia’s influence and interests. Russia’s tactics to achieve these objectives include pursuing a “multi-vector” strategy of seeking good relations with all players, encouraging balanced trade and high-tech inward investment, using arms and energy exports as foundational instruments to develop more comprehensive ties, conducting flexible diplomatic alignments in which Moscow seeks to avoid backing one side in territorial or other disputes so as to induce all parties to curry Moscow’s favor, and “Project Siberia.” The latter strategy of developing the Russian Far East by increasing its economic integration within East Asia has both defensive and offensive purposes. Moscow hopes to counter Chinese economic absorption of Siberia as a raw material appendage while simultaneously building a more solid foundation for promoting Russia’s regional influence. Russia’s most important Asian relationship is clearly with China. The two countries share interests in maintaining stability in the Korean Peninsula, Central Asia, and the Middle East—all regions where their local allies are threatened by various forces. China has clearly emerged as Russia’s most important trading partner, gateway to other Asian markets, and soon could become its main source of foreign investment. Meanwhile, Beijing is eager to benefit from Moscow’s growing interest in Asian affairs to manage their disruptive North Korean neighbor, territorial disputes with other Asian countries, and the uncertainties generated by the U.S. Asian pivot. In recent years, Russia has relaxed its operational “firebreaks” with China, partnering with China on issues that until recently were out-of-bounds. Whereas in the past Russia was unwilling to sell China its most advanced weapons systems, now Moscow policymakers have decided to run the risk of further strengthening the Chinese military-industrial complex through transfers of more advanced weapons systems in order to earn money and, more importantly, retain market share and influence over the Chinese military establishment. After years of stagnation, Russia’s arms sales to China are again booming; for the first time, Russia is willing to sell China weapons systems that it has not offered its long-standing defense partner India. Similarly, Russian leaders have been allowing China to assume a larger economic role in the Russian and Central Asian energy markets in order to secure Chinese capital to help Russia and its allies develop new energy production. For example, Russian and Chinese energy firms are partnering to pursue joint ventures in Siberia and even the Arctic. Although China has eroded Russia’s previously dominant economic presence in Central Asia, Chinese investment and trade with Russia’s southern neighbors is helping to promote stability in a region that, should it experience something like the Arab Spring, could present a grave security threat to neighboring Russia as well as China. For the most part, the Russian national security community does not see China as a near-term military threat to Russia. It is true that some Chinese military actions alarm Russians. For example, some recent Chinese naval exercises near Russian waters have been followed by Russian military exercises in the same regions. But Russian analysts still believe their conventional military power and weapons systems are superior to those of China. Although the People’s Liberation Army is gaining a quantitative advantage in some metrics, Russia’s nuclear potential remains considerably ahead—and Moscow’s military buildup seeks to keep things that way. Russian official discourse regarding China eschews dire or threatening language and is always embedded within the rhetoric of a strategic partnership. China’s tactics and goals have melded well with those of Russia. Chinese officials make a show of treating their Russian counterparts as representatives of an equal great power, a status they deny India and Japan. When Xi visited Sochi, he played up his knowledge and respect for Russian culture and sought out bilateral face time with Putin. 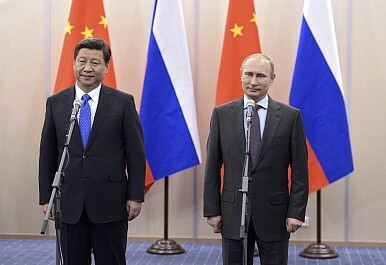 Thanks to the convergence of their models of government and their national ideologies, Russian and Chinese leaders increasingly share a common conceptual framework that is distrustful of popular democracy and of unconstrained free market economics and that shuns criticisms over other countries’ human rights practices. Their joint statements and actions reinforce each other’s legitimacy. Although wary about how Russia exploits its energy exports in the case of Ukraine and other European countries, Chinese energy managers still want to obtain some Russian oil and gas even while limiting their dependence on any single external energy source. Chinese analysts keep to themselves whatever doubts they might have about Russians’ staying power as a great power, their nations’ lack of mutual trust and checkered historical relationship, or Russians’ xenophobic views of the Chinese. In terms of global goals, Russia and China share concerns about U.S. hegemony and Washington’s military alliances and capabilities. Although China does not have or seek a formal military alliance with Russia, some Chinese are concerned about Beijing’s lack of powerful friends and how the U.S.-led Asian pivot might threaten China’s security. Russians may not worry much about the Asian pivot, and perhaps see the growing U.S. attention to Asia as enhancing Russia’s leverage in the Middle East as well as with Beijing, but Russian anxieties over NATO’s activities in Europe are sufficient to make Beijing an attractive partner. More generally, Russia and China have bad relations with many of their other neighbors, so each wants to keep their bilateral ties decent to avoid having yet another alienated neighbor. For the most part, Russians and Chinese are satisfied about the recent settlement of their territorial disputes. Russian anxieties about Chinese immigration into the Russian Far East have faded now that it is evident that Chinese immigrants in Russia prefer to work in Moscow rather than Siberia and that, rather than become permanent residents, they typically stay in Russia for only a few years and then return to their home countries. Foreign immigrants in Russia still overwhelmingly come from Central Asia. If anything, Russian policymakers want to attract more Chinese entrepreneurs and investment to the underdeveloped Russian Far East. Plans for joint Russian-Chinese economic, energy, and agricultural projects in their lengthy border regions remain undeveloped, a source of mutual frustration though not tension. To assuage Russian anxieties about the growing Chinese economic presence in Central Asia, which includes Beijing’s developing transcontinental east-west transportation networks that bypass Russian territory and Moscow’s pushing regional integration institutions and currency arrangements that could harm Chinese economic interests, Beijing defers to Moscow’s security primacy in the region. The PLA has eschewed establishing a permanent presence in Central Asia or even selling weapons to Central Asian militaries, which rely heavily on weapons imported from Russia. China’s main problem is that Russia may not prove sufficiently powerful to maintain Eurasia’s security should the NATO drawdown in Afghanistan further regional disorder. China might then have to assume a more elevated regional security profile than Beijing would prefer. Russia’s improving relationship with Japan and Vietnam, and traditionally good ties with India, naturally affect Moscow-Beijing exchanges. Russia and Japan share several overlapping geopolitical and economic interests. They are trying to become more influential players in regional economic integration schemes and Korean issues as well as to develop closer energy and economic ties. Tokyo wants more Russian oil and natural gas, while Moscow would like increase Japanese inward investment to modernize the Russian economy and develop the Russian Far East. Russia and Japan have yet to resolve their territorial dispute, but they have intensified their negotiations. Meanwhile, they have bracketed their territorial differences and agreed to pursue mutually profitable economic and security ties. Russia and Vietnam recently upgraded their relationship to that of a “comprehensive strategic partnership.” Despite periodic Chinese protests, Vietnam has become an important Russian energy client, arms buyer, and security partner. Unlike the United States, Russians are seeking a permanent naval presence in Vietnam. Sino-Indian relations are stable, and New Delhi has sought to expand ties with Europe, Japan, and the United States, but Russia still provides most of India’s weapons, is an important economic partner, and helps New Delhi balance its close this with Pakistan. Although Russian and Chinese diplomats have declined to focus much on these regional issues, they both understand that Russia wants to have diplomatic options and pursue economic and energy opportunities beyond those with China. They also recognize that these extra-China ties provide Moscow with leverage in Beijing. PRC policymakers cannot presume that Russia needs good relations with China due to a lack of alternative diplomatic options. Although Chinese policymakers would like more Russian support for their territorial or history disputes with Japan, they at least want to keep Moscow from siding with Beijing’s rivals or from criticizing China’s newly assertive policies in the Pacific. This comprehensive marriage of convenience between Russia and China looks set to continue for years. Russia’s most serious military threat in Asia is of a war on the Korean Peninsula or the collapse of neighboring North Korea. Either development would confront Moscow with massive security and economic problems, ranging from loose nukes and other WMDs, massive refugee flows, and an abrupt decrease in Korean and other foreign investment in the Russian economy. Russian security already suffers each time North Korea detonates a nuclear weapon or launches a long-range ballistic missile, which leads the United States to strengthen its missile defense capabilities, which Russians profess to see as threatening their own nuclear deterrent. Moscow has tried to avert these threats by using diplomacy to moderate the policies of Pyongyang and its neighbors and by cooperating with China and the United States on Korean issues. More originally, Russian officials have been dangling before the two Koreas the specter of potentially massive riches if they set aside their differences and allow Russian firms to construct energy pipelines and railroads through their territory that can serve as commercial arteries for Russian-East Asian economic exchanges. Here and elsewhere, Moscow’s big problem is that it has major stakes at issue but lacks the means to protect them. Russia has little influence in Pyongyang, except when North Korean diplomats seek maneuvering room with Beijing. Following the end of their Cold War estrangement, Moscow has developed relations with South Korea that are decent but not especially close or comprehensive. That description is also applicable to Russia’s ties with most Asian countries. The U.S. and Russia share important goals in Asia. They both want to avert further nuclear proliferation, keep China’s rise on a peaceful path, benefit from Asia’s dynamic economy, and avoid a war on the Korean Peninsula or between China and Japan or China and India. Russians may not welcome the U.S. military ties with Japan, Pakistan and South Korea, but they recognize their stabilizing deterrent value and would enjoy a nuclear-armed Japan or South Korea, or a snarly and isolated nuclear-armed Pakistan, even less. The United States could cooperate with Russia more effectively by not treating Moscow as an afterthought in its Asian policies. Russians bristle whenever U.S. leaders, such as Defense Secretary Chuck Hagel at last year’s Shangri-La regional security conference, describe their key Asian partners and policies without even mentioning Russia. It is true that Russia is neither an ally nor an adversary of the United States in Asia, and that Americans do not need to buy Russian weapons and energy extorts, which makes it hard to position Russia in the Asian pivot. But Washington should set aside their private beliefs and follow their Chinese counterparts’ playbook in professing to see Moscow as an important and potentially constructive actor in Asia rather than as a regional irrelevancy. What does Russia have to offer Asia?